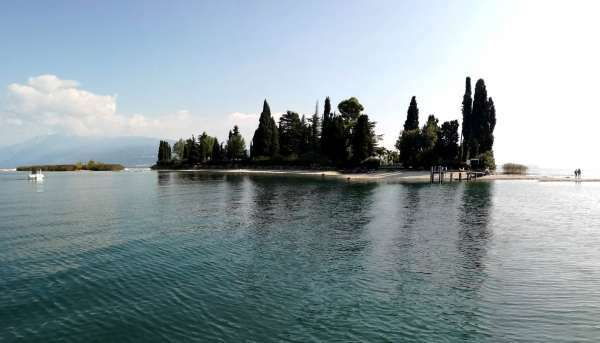 Garda Island is probably one of the most beautiful places of Lake Garda. It is a place particularly rich in history, charm, and mysterious legends. It’s an island surrounded by crystal clear water, and there has been a succession of peoples here, from the Romans to the Longobards. This place was also visited by Saint Francis of Assisi, Saint Anthony from Padua, Saint Bernard from Siena and perhaps also Dante Alighieri. In the South corner of the island is a luxurious Palace that dates back to the beginning of the 1900’s built in a neo gothic venetian style. It is a truly imposing building, dense in architectural details worth of notice. 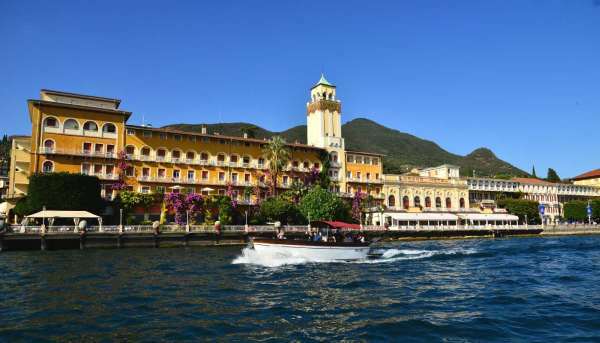 On the side overlooking the lake is a splendid italian style garden that extends itself up to the feet of the palace. Around the island the garden continues immersed in luxuriant vegetation, unique flowers and many plants typical of Lake Garda like cypresses, acacia trees, lemon trees, and, near the water, magnolia trees and agave trees. The singing of birds, the frequent colonies of grey herons that choose to reproduce here, swans, and many more species are guardians of this small corner of paradise. In ancient times the Island was known as “Insula Craniae”. 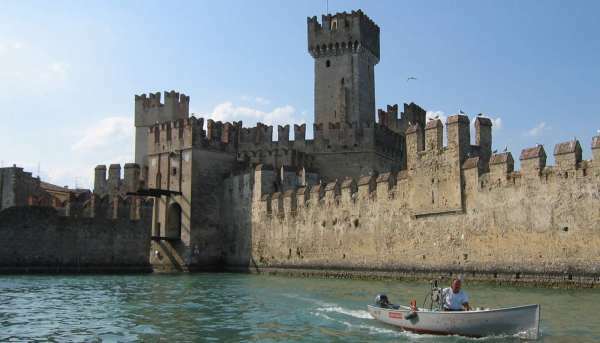 After the year 1000 is was known with many names: Garda Island, Monks’ Island, Lechi Island, Scotti Island, de Ferrari Island, and Borghese Cavazza Island. The island was used since roman times as a hunting reserve and stayed as such until 870. It was later conquered by Carlomanno, who donated it to monks. In 1221 Saint Francis of Assisi decided to find refuge in this secluded island to live with fellow monks as hermits devoted to prayer and penitence. The five monks in that settlement lived a contemplative existence, in absolute poverty and locked into their cells dug in rock. It is said that in 1227 Saint Anthony of Padua visited this place, as well as Dante Alighieri who was enraptured by it. From 1383 to 1444 Saint Bernard of Siena planted lemons, cedars, oranges, and olives in the convent garden, making the environment more graceful. Later on Francesco Licheto (a Franciscan as well) publicly held philosophy and theology lessons here. After his death however, began the slow decline of the hermitage and the successive suppression of religious folk on the island. 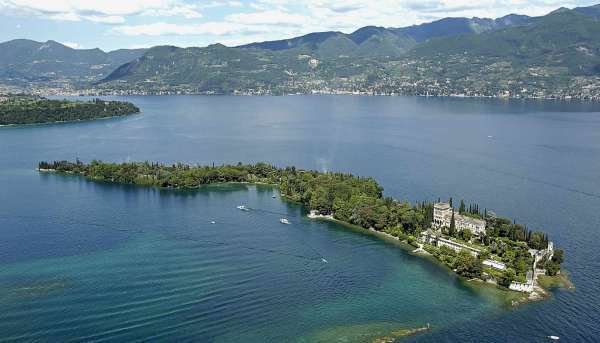 The island became property of the State and was later sold to Nobili Conter of Salò. In 1817 the owners became the Benedetti di Portese brothers first, then Giovanni Fiorentini (a merchant from Milani), followed by the Lechi Family of Brescia. In 1860 the island became a military outpost near the border, but ten years later, in 1870, the Scotti Family purchased the island in an auction, and decided to give it to Duke de Ferrari of Genoa. The Duke and his wife Maria Annenkov decided to begin the building of the palace that is still present to this day. Construction work was only terminated in 1903. This flashy palace is extremely complex and built in a neo gothic venetian style. After the death of the duke’s wife, their daughter Anna Maria inherited the entire complex. It was the daughter’s idea to enrich the perimetral garden with exotic flowers and essences of every kind. Anna Maria later married Prince Scipione Borghese and their daughter Livia continued taking care of this paradise for over fifty years. Livia married Count Alessandro Cavazza, and had three children: Novello, Emilio, and Camillo. The current owners are Charlotte (Camillo’s wife), and her children: Sigmar, Livia, Eric, Ilona, Alberta, Christian, and Lars.